Video: Edward Snowden Speaks Out Against NSA "Dragnet Mass Surveillance"
Video: Every Move You Make: US to adopt new biometric surveillance system? Video: Jacob Appelbaum: If Everything is Under Surveillance, How Can We Have a Democracy? Ron Paul Interviews Edward Snowden: Security… or Surveillance? Ron Paul: Do The Biggest Surveillance States Need More Surveillance Powers? Were senators under surveillance by Obama administration? Video: Are Trump’s Plans to Expand Obama’s Surveillance State & Activate Muslim Registry Unconstitutional? Is Hillary Clinton's Criticism of Edward Snowden a Distraction From Real Issue of Surveillance? Did Snowden’s mass surveillance leaks have a chilling effect on political activists? Can mass surveillance be stopped before it’s too late? Is the online surveillance of black teenagers the new stop-and-frisk? The Greek government’s decision to accept the EU’s recommendations on the economy will increase anger and resentment among the Greek people as the economy continues to worsen. They are concerned that a civil war can possibly take place. With the possibility of the Greek government purchasing Israeli made drones, I assume that is what they are expecting. Can We Stop America’s Surveillance State? Paranoia, Surveillance and Military Tactics: Have We Become Enemies of the Government? The Israeli Surveillance State: Did The “Shin Bet” Just Hack My Computer? When two planes flew into the World Trade Organisation buildings inNew York in 2001, the impact was twofold. First, there was shock and outrage. Second, there was a collective sentiment, at least in the US, that something must be done to prevent such a thing happening again and some form of retributive justice meted out. Governments the world over wasted no time in conveniently forcing through legislation that eroded personal and collective freedoms, under the guise of preventing terror, at a time of increasing social and economic inequalities due to a strident and exploitative economic neo-liberal agenda. If 9/11 served at least one purpose, apart from fuelling Western military imperialism according to the tenets of the neo-con Project for a New American Century, it was to provide any or every government on the planet with a reason for clamping down on its own population, stripping away civil liberties and making people acquiesce to the needs of global capital. Edward Snowden’s revelations about the US and British surveillance agencies and programmes have exposed just how far governments are prepared to go in order to snoop on virtually every activity that ordinary members of the public engage in. Politicians on both sides of the Atlantic try to justify this illegal snooping on the basis of it being carried out for people's own good on the back of self-proclaimed ‘security alerts’. But history shows that widespread surveillance by governments on their own populations has mostly been about attempting to monitor and quell dissent and genuine opposition to its policies (1). The US and British states have long been involved in illegal, duplicitous monitoring and subversion of perfectly legitimate democratic groups on their own soils. Western intelligence agencies have been used to crush democracy at home in order to serve the interests of elite state-corporate players. From Martin Luther King and the Occupy Movement to Veterans for Peace, the US state has used the full panoply of resources to infiltrate, monitor or subvert. Today, democratic movements that seek to legitimately question and challenge the influence of Wall Street, US military policy abroad and a range of other policies that have serve elite interests are spied on and ‘neutralised’. The conclusion is that mass surveillance occurs because legitimate political dissent that poses a direct challenge to the one percent will not be tolerated. Should people in India be worried about the rolling out of the Indian’s government own plans for mass monitoring, the Centralised Monitoring System? They should, given the genuine concerns being raised about the lack of Parliamentary oversight and transparency surrounding the system, as well as the scope and depth and the violation of privacy safeguards, which could be as far reaching, secretive and unconstitutional/illegal as the West’s PRISM system (2,3,4). And they should be concerned because the agenda is the same. Social and economic trends in India have been mirroring those in the West since neo-liberal economic policies were embraced by leading politicians here. The gap between rich and poor has widened, wealth is being concentrated in the hands of a relatively small number of families and billionaires, often courtesy of politicians who ‘facilitate’ the handing out of contracts and chunks of public money. The growing chasm in both India and the West between rich and poor has not been lost on policy makers who fear a backlash from ordinary folk. Such concerns were recently voiced at the World Economic Forum. It’s for good reason then that ‘homeland security’ has been beefed up in the US and drones are to be used to spy on its own citizens. It’s for good reason that the NSA and its British equivalent are paranoid about their populations’ political views, allegiances and activities. Mass surveillance of ordinary people is not about preventing terror; it’s about stopping ordinary folk seeking to stop a further shift in the balance of power towards elite interests. And it’s also for good reason that the Indian government is investing massively in military equipment and surveillance at a time when the rich are looting the economy and protests and uprisings are occurring across the nation in order to protect their lands, forests and communities from this assault. India’s top ten billionaires account for over 12 percent of the country’s GDP, while 7,850 High Net Worth individuals account for US$935 billion, half of India’s GDP. 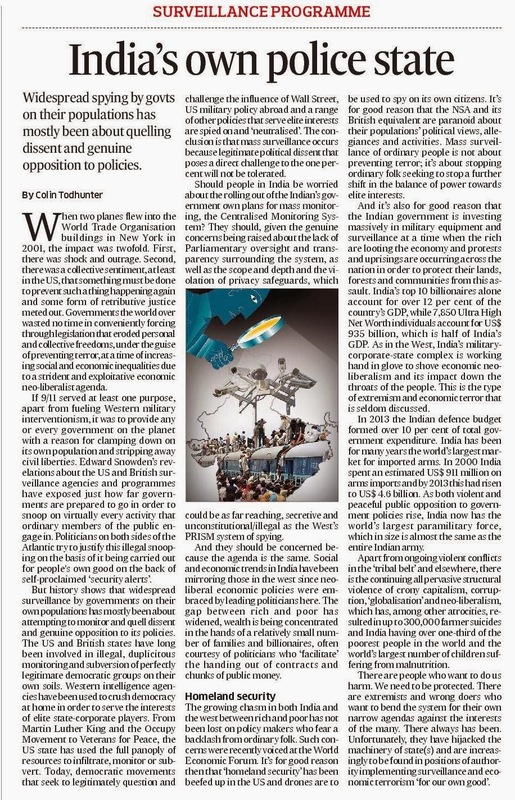 As in the West, India’s military-corporate-state complex is working hand in glove to shove economic neo-liberalism and its impact down the throats of the people. This is the type of extremism and economic terror that is seldom discussed. In 2013, the Indian defence budget formed over ten percent of total government expenditure. It has been for many years the world’s largest market for imported arms. In 2000, India spent an estimated US$ 911 million on arms imports; by 2013, this had risen to US$4.6 billion. As both violent and peaceful opposition to government policies is on the rise among many of the nation's poorest people, who become conveniently tarnished by many mainstream commentators as 'the enemy within', India now has the world’s largest paramilitary force in place to 'deal' with them.(5). Apart from ongoing violent conflicts in the ‘tribal belt’ and elsewhere, there is the continuing all pervasive structural violence of crony capitalism, corruption, ‘globalisation’ and neo-liberalism, which has, among other atrocities, resulted in up to 300,000 farmer suicides and India having over one-third of the poorest people in the world and the world’s largest number of children suffering from malnutrition (6). There are people who want to do us harm. We need to be protected. There are extremists and wrong doers who want to bend the system for their own narrow agendas against the interests of the many. There always has been. Unfortunately, they have hijacked the machinery of state(s) and are increasingly to be found in positions of authority implementing surveillance and economic terrorism ‘for our own good’. If GCHQ mass surveillance catches terrorists why not armed gangs? On December 16, Federal District Court of the District of Columbia Judge Richard Leon issued a damning 68-page ruling. He called NSA spying unconstitutional. It's "almost Orwellian," he said. "The threshold issue is whether plaintiffs have a reasonable expectation of privacy that is violated when the Government indiscriminately collects their telephone metadata along with the metadata of hundreds of millions of other citizens without any particularized suspicion of wrongdoing, retains all of that metadata for five years, and then queries, analyzes, and investigates that data without prior judicial approval of the investigative targets." "I cannot imagine a more 'indiscriminate' and 'arbitrary' invasion than this systematic and high-tech collection and retention of personal data on virtually every single citizen for purposes of querying and analyzing it without prior judicial approval." "Surely, such a program infringes on 'that degree of privacy' that the founders enshrined in the Fourth Amendment." It prohibits unreasonable searches and seizures. Doing so violates core constitutional law. Mass NSA surveillance does it writ large. It has nothing to do with national security. America's only enemies are ones it invents. NSA spies globally. It watches everyone. It monitors allies. It's about control. It's for economic advantage. It's to be one up on foreign competitors. It's for information used advantageously in trade, political, and military relations. "This is a strongly worded and carefully reasoned decision that ultimately concludes, absolutely correctly, that the NSA’s call-tracking program can’t be squared with the Constitution." "As Judge Leon notes, the government's defense of the program has relied almost entirely on a 30-year-old case that involved surveillance of a specific criminal suspect over a period of two days." "The idea that this narrow precedent authorizes the government to place every American under permanent surveillance is preposterous." "We hope that Judge Leon's thoughtful ruling will inform the larger conversation about the proper scope of government surveillance powers, especially the debate in Congress about the reforms necessary to bring the NSA's surveillance activities back in line with the Constitution." "The bipartisan USA Freedom Act, which has 130 co-sponsors already, would address the constitutional problems that Judge Leon identifies." The Electronic Frontier Foundation (EFF) calls the proposed measure "a substantial improvement to America's laws regarding mass surveillance." At the same time, it's "a floor, not a ceiling." It addresses a small portion of NSA abuses and "overreaching government secrecy." It leaves important unfinished business. EFF endorses passage. Lots more needs to be done, it stressed. Judge Leon's ruling marks the first successful NSA legal challenge. Conservative activist Larry Klayman and Charles Strange filed suit (Klayman v. Obama). Strange's son was killed in Afghanistan. Months earlier, ACLU filed a similar suit (ACLU v. Clapper). It challenged "the constitutionality of the National Security Agency's mass collection of Americans' phone records." NSA claims authorization under the Patriot Act's Section 215. It's known as the "business records" provision. It permits collecting "any tangible thing...relevant" to alleged foreign intelligence or terrorism related investigations. It way oversteps. It's unconstitutional. It does so by authorizing the FBI to investigate anyone based on what they say, write, or do with regard to groups they belong to or associate with. It violates Fourth and Fifth Amendment protections by not telling targeted subjects their privacy was compromised. It subverts fundamental freedoms for contrived, exaggerated, or nonexistent security reasons. "Whatever Section 215's 'relevance' requirement might allow, it does not permit the government to cast a seven-year dragnet sweeping up every phone call made or received by Americans," said ACLU. On November 22, US District Court for the Southern District of New York Judge William Pauley heard arguments. He hasn't yet ruled. Judge Leon granted plaintiffs' request for a preliminary injunction. He ordered the Obama administration to stop collecting their phone data. He ruled whatever it currently has must be destroyed. At the same time, he stayed his ruling. He cited potential "significant national security interests at stake." He gave Obama's Justice Department time to appeal. He said his decision applies only to plaintiffs. It doesn't affect NSA's mass data-mining. At the same time, his ruling is an important first step. For years, he said, constitutional issues were adjudicated under "a cloak of secrecy." He referred to the unaccountable FISA court. It's virtually rubber-stamp. It mocks judicial fairness and legitimacy. Judge Leon's ruling is an important step in the right direction. "While Congress has great latitude to create statutory scheme like FISA," he said, "it may not hang a cloak of secrecy over the Constitution." EFF called his decision "historic." Ruling for Klayman and Strange symbolically condemns mass surveillance. "The Fourth Amendment does not prohibit the obtaining of information revealed to a third-party and conveyed by him to Government authorities, even if it is revealed on the assumption that it will be used only for a limited purpose and the confidence placed in the third-party will not be betrayed." The Court added that information revealed to another source "takes the risk (of being) conveyed" to someone else. It said in "expos(ing) that information" to phone company equipment, individuals "assumed the risk that the company would reveal to police the numbers dialed." "People disclose the phone numbers that they dial or text to their cellular providers, the URLS that they visit and the e-mail addresses with which they correspond to their Internet service providers, and the books, groceries and medications they purchase to online retailers." "I would not assume that all information voluntarily disclosed to some member of the public for a limited purpose is, for that reason alone, disentitled to Fourth Amendment protection." In United States v. US District Court (the so-called Keith case) (1972), a unanimous Supreme Court ruling upheld Fourth Amendment protections in cases involving domestic surveillance targeting a domestic threat. "The question before me is not the same question that the Supreme Court confronted in Smith." It's "a far cry from the issue in this case." "This short-term, forward looking (as opposed to historical), and highly-limited data collection is what the Supreme Court was assessing in Smith." "The NSA telephony metadata program, on the other hand, involves the creation and maintenance of a historical database containing five years' worth of data." "And I might add, there is the very real prospect that the program will go on for as long as America is combatting terrorism, which realistically could be forever." "Admittedly, what metadata is has not changed over time." "As in Smith, the types of information at issue in this case are relatively limited: phone numbers dialed, date, time, and the like." "But the ubiquity of phones has dramatically altered the quantity of the information that is now available, and more importantly, what that information can tell the Government about people’s lives." "Put simply, people in 2013 have an entirely different relationship with phones than they did thirty-four years ago." "Whereas some may assume that these cultural changes will force people to 'reconcile themselves' to an 'inevitable' 'diminution of privacy that new technology entails,' I think it is more likely that these trends have resulted in a greater expectation of privacy and a recognition that society views that expectation as reasonable." In other words, privacy intrusions today are simple. They happen with digital age technology ease. Greater diligence is required to protect rights too important to lose. Courts and Congress are obligated to do so. Judge Leon's ruling represents an important first step in the right direction. Lots more needs to be done. "I acted on my belief that the NSA's mass surveillance programs would not withstand a constitutional challenge, and that the American public deserved a chance to see these issues determined by open courts." "Today, a secret program authorized by a secret court was, when exposed to the light of day, found to violate Americans. rights. It is the first of many." Separately, he offered to help Brazil investigate harmful NSA spying. He'll do it in return for permanent political asylum. He said so in an open letter to all Brazilians. Folha de S. Paulo published it. "I've expressed my willingness to assist where it's appropriate and legal, but, unfortunately, the US government has been working hard to limit my ability to do so." "Until a country grants me permanent political asylum, the US government will continue to interfere with my ability to speak out." Brazilian senators asked Snowden for help. He's willing to provide it. "I don't want to live in a world where everything that I say, everything I do, everyone I talk to, every expression of creativity or love or friendship is recorded." "That's not something I'm willing to support, it's not something I'm willing to build, and it's not something I'm willing to live under." "If Brazil hears only one thing from me, let it be this: when all of us band together against injustices and in defense of privacy and basic human rights, we can defend ourselves from even the most powerful systems."